Though working five centuries apart and in radically different media, these artists share a deep preoccupation with the nature of human experience and existence. Bill Viola / Michelangelo will create an artistic exchange between these two artists and will be a unique opportunity to see major works from Viola’s long career and some of the greatest drawings by Michelangelo, together for the first time. It will be the first exhibition at the Royal Academy largely devoted to video art and has been organised in partnership with Royal Collection Trust. The exhibition will comprise 12 major video installations by Viola, from 1977 to 2013, to be shown alongside 15 works by Michelangelo. 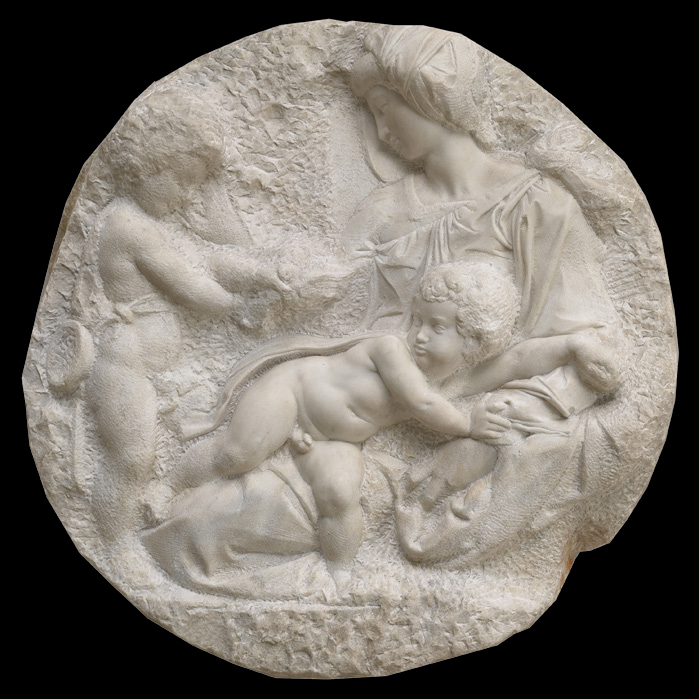 They include 14 highly finished drawings, considered to be the high point of Renaissance drawing, as well as the Royal Academy’s ‘Taddei Tondo’. It will propose a dialogue between the two artists, considering Viola as an heir to a long tradition of spiritual and affective art, which makes use of emotion as a means of connecting viewers with its subject matter. It also aims to recapture the spiritual and emotional core of Michelangelo, beyond the awesome grandeur of his works. Viola first encountered the works of the Italian Renaissance in Florence in the 1970s where he spent some of his formative years. A residency at the J Paul Getty Museum, Los Angeles, in 1998 renewed his interest in Renaissance art and in the shared affinities with his own practice. In 2006, Viola visited the Print Room at Windsor Castle to see Michelangelo’s exquisite drawings, which he had known in reproduction since his youth. The meeting proved a catalyst for the exhibition, which evolved as a conversation between Viola and Martin Clayton, Head of Prints and Drawings at Royal Collection Trust. 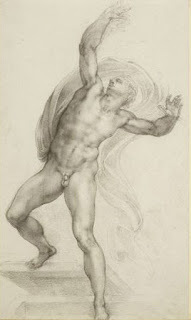 Rather than setting up direct comparisons between the artists, or suggesting that Michelangelo has been an instrumental influence on Viola’s work, the exhibition will examine the affinities between them, bringing together specific works to explore resonances in their treatment of the fundamental questions: the nature of being, the transience of life, and the search for a greater meaning beyond mortality. Viola stated, “Through my travels and experiences first in Florence, then primarily in non-Western cultures, and in combination with my readings in ancient philosophy and religion, I began to be aware of a deeper tradition, an undercurrent stretching across time and cultures... the ancient spiritual tradition that is concerned with self-knowledge.” Throughout his career, Viola has experimented with large-scale video installations; he is one of the first artists to have conceived video on an immersive architectural scale. He has increasingly utilised his medium’s fundamental elements – light, sound and time – to create visceral works that consider metaphysical questions about the nature of existence and reality. Unusually for video, they give shape to inner states of being rather than mirroring the world around us. The exhibition will present Michelangelo’s works as more than examples of genius and virtuosity, revealing a personality that was frequently vulnerable. The drawings included were executed in the last 35 years of his life, some as gifts and expressions of love for close friends, others as private meditations on his own mortality. Religious imagery of the Virgin and Child, the Crucifixion and the Resurrection reflect on the presence of death and the eternal. In others, references to Classical mythology act as metaphors for the human condition. At their heart, as with Viola’s work, is an exploration of the body as a vessel for the eternal soul. The exhibition is conceived as an immersive journey through the cycles of life, exploring the transience and tumult of existence and the possibility of rebirth. It will begin and end with a pairing of works that reflect on a central paradox: the presence of death in life. 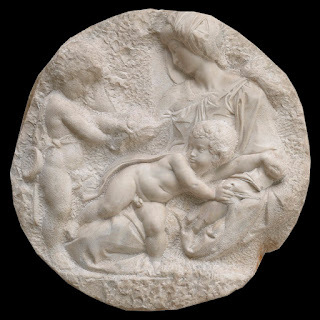 Michelangelo’s The Virgin and Child with the Infant St John the Baptist, c. 1504-05, known as the ‘Taddei Tondo’, depicts the Baptist holding a fluttering bird from which the infant Christ recoils, the scene heralding his eventual sacrifice on the Cross. 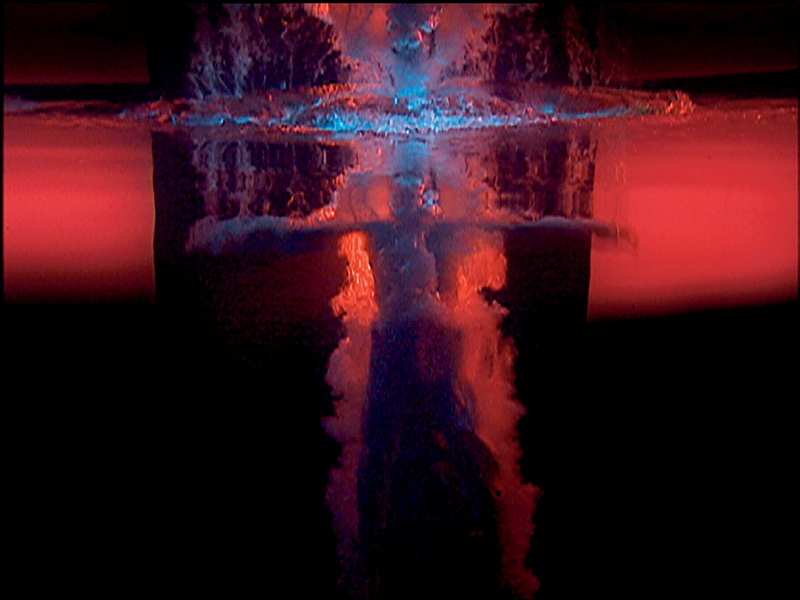 It will be displayed alongside Viola’s The Messenger, 1996 (Bill Viola Studio), which uses the metaphor of water to depict the eternal cycle of birth, life and death. The theme will be further explored in drawings relating to the Virgin and Child, as well as the Lamentation, c. 1540 (British Museum, London), which will be shown facing Viola’s Nantes Triptych, 1992 (Bill Viola Studio), three screens that individually portray a woman giving birth, a figure floating in a mysterious half-light, and Viola’s own mother on her deathbed. 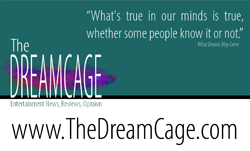 Viola stated, “It is the awareness of our own mortality that defines the nature of human beings”. The exhibition continues with a series of installations by Viola that reflect on the nature of human experience, as one set by moral and ethical choices, besieged by fears and ultimately experienced in solitude. 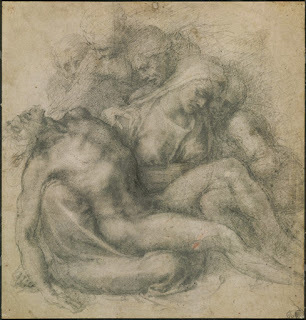 At the centre of the exhibition will be Michelangelo’s extraordinary ‘Presentation Drawings’ of the 1530s (loaned by Her Majesty The Queen, Royal Collection, London), which he produced as gifts for Tommaso de’ Cavalieri, a young Roman nobleman for whom he developed a deep love. Demonstration pieces relating to the craft of drawing with chalk, they also explore complex myths and Neoplatonic concepts, and were created as expressions of devotion towards their recipient. They will include the Tityus, 1532, which acts as an allegory for the opposed forms of love in Neoplatonic philosophy: the punishment of base lust devoid of spiritual love. Further drawings by Michelangelo will explore similar allegorical struggles in life, from the labours of Hercules to the fall of Phaeton. 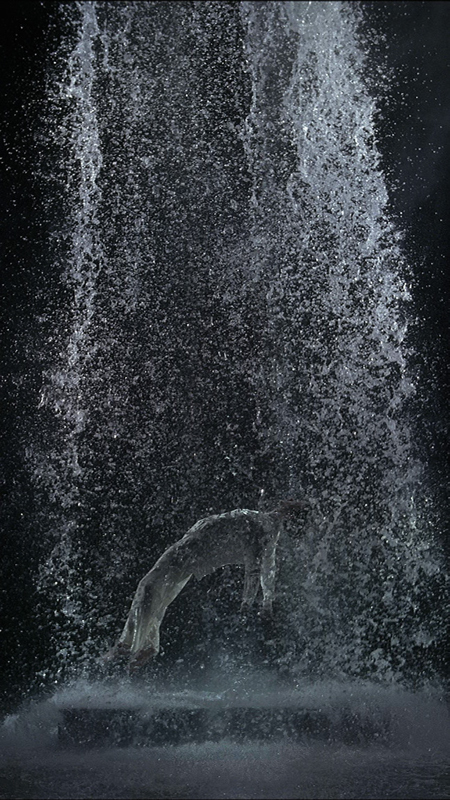 These will be shown in opposition to the quiet stillness of Viola’s Man Searching for Immortality/Woman Searching for Eternity, 2013 (Bill Viola Studio). Life-size images of an ageing man and woman are projected onto two black granite slabs, showing them slowly examining every inch of their naked bodies by torchlight, unable to hide from their earthly state. The final galleries will include a series of works that more directly consider mortality and the possibility of rebirth. Among them are Michelangelo’s most poignant drawings, two Crucifixions from the final years of his life. 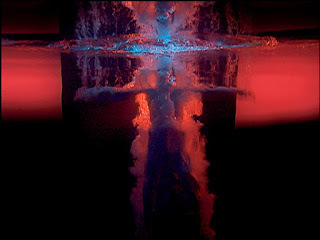 The exhibition will conclude with Viola’s most majestic works; the five-screen installation Five Angels for the Millennium, 2001 (Bill Viola Studio), and the monumental projections, Fire Woman, 2005, (Bill Viola Studio), and Tristan’s Ascension (The Sound of a Waterfall Under a Mountain), 2005 (Bill Viola Studio). 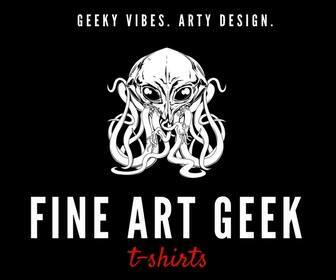 They depict bodies falling and rising out of view, in different ways conjuring the body’s final journey and the passage of the spirit, in obscurity or in glory. Organisation Bill Viola / Michelangelo is organised by the Royal Academy of Arts, London in partnership with Royal Collection Trust. The exhibition is curated by Martin Clayton, Head of Prints and Drawings at Royal Collection Trust; with Kira Perov, Bill Viola Studio; and Andrea Tarsia, Curator, Royal Academy of Arts. The exhibition is accompanied by a fully illustrated catalogue by Martin Clayton with contributions from Kira Perov. Bill Viola / Michelangelo runs from 26 January – 31 March 2019, find out more and book tickets at www.royalacademy.org.uk. Michelangelo Buonarroti, The Risen Christ, c. 1532-3. Black chalk on paper, 37.2 x 22.1 cm. Royal Collection Trust / © Her Majesty Queen Elizabeth II 2018.